RUTH WALKER repairs aged, damaged, and deteriorating books ranging from the 17th century to heirloom family Bibles as well as modern day cookbooks and well-loved children's books in her Sonoma County, California studio. 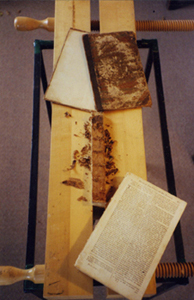 Conservation and archival techniques require exacting methods that are continually updated with ever expanding scientific understanding of the chemistry of paper, pigments, dyes, inks, bookcloth and leather tanning. She is dedicated to using binding skills that are appropriate to the age and structure of the books that she restores. Her large client base includes libraries, medical societies, rare book and antique dealers, as well as book collectors. Many have been with her for decades. 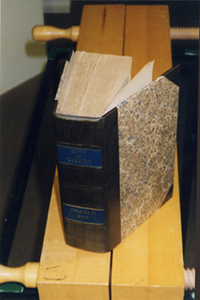 Ruth has published numerous articles on bookbinding and collection over the years. You are invited to download a portfolio of these articles in pdf format; after download, double click on the page icons.